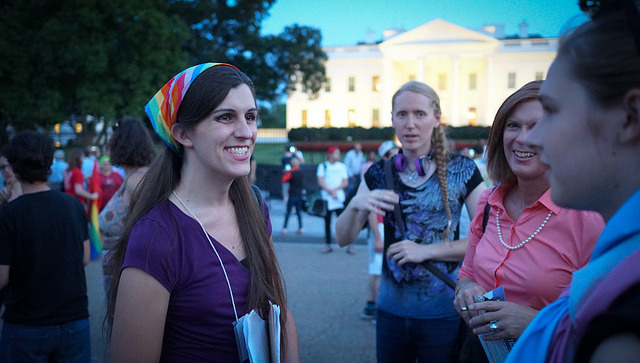 Danica Roem at the Protest Trans Military Ban in Washington, DC on July 26, 2017. Photo courtesy of Ted Eytan via Flickr Creative Commons. A year ago, Danica Roem was a metal vocalist and a newspaper reporter in Prince William County, Virginia. Now, she is a state legislator for that state, setting two firsts. One, she is the first state legislator in the nation with multiple metal albums out. Her band Cab Ride Home has four albums out, two of them with art of Roam flashing the horns, tongue out on the cover. Two, she is the one of the first state legislators to identify themselves as transgender during their campaign. Don Shaw, the local Democratic Committee leader who recruited Roem to run says that he didn’t do so because she’s a transgender woman, but it must have been part of the conversation. Her opponent, incumbent Republican Bob Marshall, was the force behind Virginia’s unsuccessful bathroom bill this last January. Had it been successful, it would have made it a crime for Roem to use the women’s bathroom in any public place. Bathroom bills are the recent craze among Republican lawmakers around the country. While there are no recorded instances of a predator disguising themselves as a trans person or a member of another gender to seek victims in restrooms, conservatives tried hard to push that message in more than a dozen states. States that passed them saw sanctions from states more concerned with actual safety than with fictional LGBT boogeymen, but they keep popping up. Roem’s victory over the author of one of these bills is important, but she says that transgender issues are barely a drop on the bucket of what she wants to accomplish. She cites her priorities as “quality of life” issues, such as roads, schools, and basic infrastructure.